THE LAST CAMELLIA tells the story of two women -- Flora and Addison; and jumps back and forth between the 1940s and the 2000s. Flora is an American botanist who agrees to go to England, infiltrate a house and acquire a secret specimen of camellia for an international ring of flower thieves. She does this by working as a nanny to the family's four children. Addison, on the other hand, is a garden designer married to Rex. She has a secret from her past that is coming back to haunt her so she convinces her husband to move to England and live in the very same estate where Flora used to reside. The author weaves both Flora's and Addison's stories together using an old notebook that Addison discovered along with the mysteries that have occurred over the years at this English country estate. I admit that I was most intrigued by the description of THE LAST CAMELLIA; however, I didn't love it like I had hoped. This might sound odd, but I can't put my finger on the reason why. I liked the characters okay, but I didn't love -- them so maybe that was the issue for me. What I can say for sure is that I appreciated Ms. Jio's storytelling abilities and I ended up being surprised by how both stories eventually played out. One thing that Ms. Jio did a very good job of in this novel was bringing both of these women's stories to life. Often times, when I read a book that goes back and forth between two related stories, I find that one interests me much more than the other. However, that wasn't the case with THE LAST CAMELLIA. I actually was interested in both women. I also appreciated how well the author moved back and forth between the two time periods. I thought she did a great job of tying the stories together and giving clues about how the stories were related. Another thing I enjoyed about THE LAST CAMELLIA was the setting of the novel. Even though the stories took place almost sixty years apart, for the most part, the stories took place at the English estate. I loved how she described the house, the gardens, and the gorgeous flowers. It was apparent that Ms. Jio did some research not only on the time period and location but also on the history of flowers. THE LAST CAMELLIA would make for an interesting book club pick. I wasn't able to find a formal discussion guide yet, but I have a feeling that one is in the works. (She has reading guides for all of her other novels.) There is much to discuss about the various characters, namely Flora and Addison, but it also might be fun to explore the differences in the time periods. Furthermore, you might want to explore some of the main themes in the novel including family dynamics, honesty, deception, fear, deceit, love, marriage, and secrets. 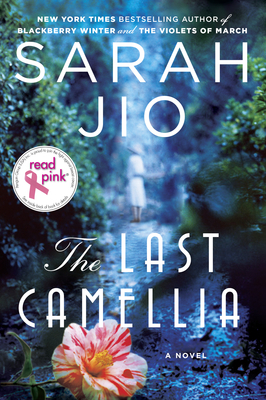 While THE LAST CAMELLIA wasn't my absolute favorite Sarah Jio novel, I do think it has a little something for everyone. Fans of mysteries and historical fiction will definitely want to get their hands on a copy. It's always a little disappointing when you don't totally love a favorite author's latest book, but such things happen every once in a while. I'm still looking forward to reading this one and am interested in the garden connection. I haven't read anything by her yet, but she's definitely on my TBR list. I met Jio briefly as well and thought the same thing. It seems her books are consistently good. I must, must, must read this author's books! I always read such great reviews of them.